It's easy to get enterprise security right. A single solution with a single management platform unifies 17 technologies to proactively protect all of your devices — PCs, Macs, Linux systems, smartphones, virtual machines, tablets, and servers. Simplify management and reduce costs while defending your endpoints from today’s most insidious and stealthy threats, including rootkits and advanced persistent threats (APTs). Complete simplicity — Installation is easy. With as few as four clicks and in just 20 minutes, you’re up and running. McAfee ePolicy Orchestrator (McAfee ePO) technology streamlines policy management across all devices and provides a single pane of glass for visibility. Additionally, to improve reaction time when threats strike, your security team can ask questions and perform actions in real time. Endpoint security should support your business, not slow it down. Defend your business and empower your employees to be productive. Strong, simple, and fast, McAfee® Complete Endpoint Protection—Enterprise suite provides real-time visibility into security and risk along with unified management. McAfee delivers the highest scoring threat protection to all of your devices, from servers and virtual machines to PCs and mobile devices—in one easy-to-manage, integrated solution. Guard systems and data against complex, stealthy threats with dynamic application control, behavioral intrusion prevention, instant risk assessment, hardware-enhanced security to defend against rootkits, and global threat intelligence across all threat vectors. McAfee Complete Endpoint Protection—Enterprise suite makes it easy to get security right, from turnkey installation to rapid response. With one unified solution, you cover all the devices in your enterprise—PCs, Macs, Linux systems, virtual machines, smartphones, tablets, and servers. Reduce management complexity and cut costs, while protecting endpoints against rootkits, mobile malware, targeted web and email attacks, and persistent threats. Achieve a level of powerful, efficient protection and management that’s available only from McAfee, the market leader in endpoint security. Get fast, top-rated hardware enhanced protection against today’s toughest and stealthiest threats. Unify management across all your endpoints, from virtual machines and servers to PCs and mobile devices. Manage risk by directing security efforts where they are needed most. Advanced antivirus, anti-malware, host intrusion prevention, device control, host-based firewall, dynamic application control, and more tackle malware, zero-day threats, and evasion attacks at every vector — mobile, data, web, email, and network. Unique dynamic application control allows installation of only known good files or applications based on a flexible, automated update model. McAfee ePO single-console management streamlines and automates workflow, policy deployment, updates, maintenance, and reporting across all of the technologies that protect your endpoints. Integration with other McAfee and third-party products increases visibility and efficiency as you add to your security arsenal. Real Time for McAfee ePO gives security staff instant access to critical data and guidance to the right responses within the natural workflow. Clearly identify which assets might be affected by which threats, and whether you have proper protection in place. McAfee Risk Advisor calculates risk scores based on threats, vulnerabilities, asset criticality, and countermeasures to help your in-house security experts optimize and prioritize patching. Real-time cloud-based McAfee Global Threat intelligence collects the latest data to protect against known and emerging cyberthreats across all vectors — file, web, message, and network. When it comes to threat protection, you can’t do any better than McAfee Complete Endpoint Protection—Enterprise. In a recent NSS Labs test, McAfee was ranked as the top-scoring vendor in defending against exploits and evasion attacks. Only McAfee takes protection into the hardware and throughout the application layer for protection like no other. McAfee Deep Defender leverages McAfee and Intel technology for industry-leading hardware-enhanced security beyond the operating system (OS). McAfee earned a perfect score for protection against rootkits that burrow deep into the kernel in a comparative review by AV-TEST. Dynamic whitelisting through application control protects users from harmful applications and code originating from zero-day threats or advanced persistent threats (APTs). See more, know more, and defend your organization better with cloud-based McAfee Global Threat Intelligence, which gives you the full spectrum of new and emerging threats in real time across all vectors—file, web, message, and network. Focused scans and focused actions provide you with security that keeps your business running smoothly 24/7 with minimal downtime. Superior performance across all platforms comes from advanced smart scanning and memory management techniques that optimize CPU and memory usage. With application control, you experience ultra-low CPU and memory usage, while avoiding excessive scans and .DAT update cycles. In as few as four clicks and 20 minutes, your security is ready to go. Unified, real-time management with McAfee® ePolicy Orchestrator® (McAfee ePO™) software streamlines your policy management workflow across all devices and provides a single pane of glass for visibility. Real Time for McAfee ePO gives you instant access to critical security data, so IT can respond 10 to 1,000 times faster when incidents occur. With dynamic application control, users can install new software by simply following approved processes, eliminating the frustrations and delays of manual whitelisting. And we include McAfee Risk Advisor to help you easily manage risk and prioritize protection for your most important assets, based on which emerging threats are affecting which assets and whether you have required mitigations in place. McAfee Complete Endpoint Protection—Enterprise brings together a strong set of proactive defenses to protect you against today’s complex threats at every stage. Here’s how we minimize risk in a typical attack scenario. Proactive measures reduce the attack surface and vulnerabilities. Instant visibility into the security health of your endpoints helps you reduce the attack surface easily and efficiently. Prioritize risk based on real-time threat updates, threat relevance, and countermeasures in place. Malware comes in contact with unsuspecting users, usually through a malicious website. Other access points are removable media, unsolicited messages from social media sites, and misconfigured or unsecured wireless networks. Safe surf and search and web content filtering reduce chance of exposure to or drive-by downloads of malware. Device control blocks use of unapproved storage media that may be infected with malware. Network connection reputation shuts down botnets, denial-of-service attacks, and malicious traffic. Mobile anti-malware prevents compromise of smartphones and tablets. Bad code runs on target machines to exploit vulnerabilities in applications or the OS. If the malware can subvert protections, it writes its code to disk. Below-the-OS detection enhanced by hardware blocks kernel and boot-level rootkits. Host intrusion prevention blocks exploits and shields unpatched vulnerabilities. Dynamic application control allows installation of only known good files or applications based on dynamic whitelisting. On-access scanning monitors memory and network traffic. Secure container for mobile email protects enterprise data on devices. Malicious code hides on the system and is made to persist, so that it survives reboot and stays hidden from security measures and from the user. Hardware-enhanced security protects against rootkits and other stealthy attacks. Host intrusion prevention protects during startup and off the network. Goal of attack is achieved—from stealing identities and intellectual property theft to bank fraud. Whitelisting prevents malicious software from tampering with known good application files and prevents execution of bad code. McAfee VirusScan® Enterprise Industry leading, enterprise-class anti-malware protection with integrated day-zero threat protection. 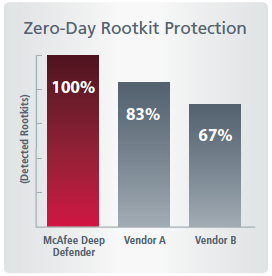 McAfee Deep Defender Stop rootkits and stealthy attacks with protection below the OS. Dynamic Application Control Prevent unwanted applications and malware from installing and executing with minimal impact on system performance, users, and administrators. Guard against unknown, zero-day threats and new vulnerabilities. Global Threat Intelligence Defend against new and emerging threats across all vectors with real-time intelligence gathered by millions of sensors worldwide. Warn users about malicious websites before they visit to reduce risk and stay compliant. Authorize or block website access. Detect, clean, and block malware from Microsoft Exchange and Lotus Domino servers with McAfee GroupShield. Secure mobile devices, data, and networks. Device Control Prevent loss of sensitive data by restricting use of removable media. Manage policies, compliance, and reporting from a single, centralized console. Instantly see and take action to adjust security health of endpoints. Pinpoint which critical assets are vulnerable to which threats. Get instant, actionable data correlation on emerging threats to quickly identify whether proper protection is in place. Reduce time spent patching and diagnosing issues. 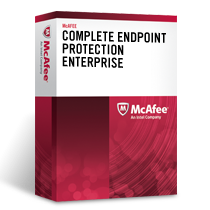 Download the McAfee Complete Endpoint Protection — Enterprise Datasheet (PDF).